Geoff was recommended to me by a mutual friend. After looking at a portfolio of websites I had created, we settled on the project design. 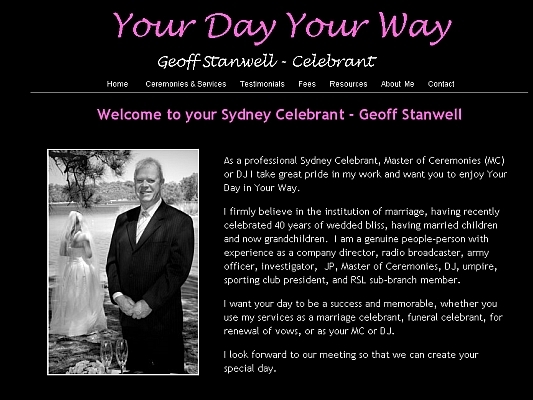 As a Sydney Celebrant Geoff’s voice is a major asset in his celebrant role, thus I showcased it via an audio stream as the introduction to his site. The website was built years ago initially using Microsoft Front Page. It was converted to WordPress a few years ago and operates flawlessly. Today, Geoff still reminds me of how successful it has been in providing his window to the world. Geoff, is now delighted with being able to have a CMS website. After initial WordPress phone tutorial with me and some homework YouTube tutorials, Geoff is very comfortable with his new website.